Phytophthora crown and spear rot – In fields with low spots (poorly drained soils) or fields with a history of crown and/or spear rot apply Ridomil Gold 4SL (mefenoxam, 4) at 1.0 pt/A, or Ultra Flourish 2E/A (mefenoxam, 4) at 2.0 pt/A, or MetaStar 2E (metalaxyl, 4) at 2.0 qt/A over beds just before 1st harvest. For new plantings, apply the same after planting or after crown covering. Do not apply Ridomil or MetaStar one day prior to harvest or illegal residues may result. For more information please see 2014 New Jersey Commercial Vegetable Production Recommendations Guide. Damping-off – To help control losses due to damping-off pathogens apply Ridomil Gold (mefenoxam, FRAC code 4) at 1 to 2 pt/A 4SL, MetaStar (metalaxyl, 4) see label, or Quadris (azoxystrobin, 11) at 0.40 to 0.80 fl oz 2.08SC/1000 row ft (for Rhizoctonia only), or Ridomil Gold at 1.0 to 2.0 pt/A 4SL plus Quadris at 0.40 to 0.80 fl oz 2.08SC/1000 row ft. in a band up to 7 in. after seeding. To help control damping-off pathogens in Collards and Kale only: Apply Uniform (mefenoxam + azoxystrobin, 4 + 11) at 0.34 fl oz 3.66SE/1000 ft row. For more information please see 2014 New Jersey Commercial Vegetable Production Recommendations Guide. Downy Mildew and Alternaria – Symptoms of downy mildew include purple to yellowish-brown spots on upper leaf surfaces. A grayish-white spore mass will develop and cover the underside of leaves under ideal temperatures (night temperatures of 46 to 61oF and day temperatures below 75oF. 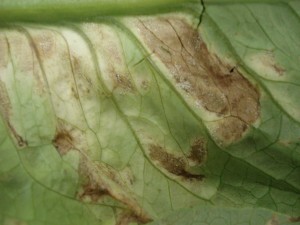 Downy mildew can kill young plants. Heavily infected leaves may drop providing entry points for bacterial infections (black rot and soft rot). Symptoms of Alternaria on infected leaves include small, expanding circular lesions with concentric rings that may have a ‘shot-hole’ appearance as lesions age. Heavily infected seedlings may result in damping-off. Control of Downy mildew and Alternaria begin with preventative fungicide applications. Please refer to page F31 and the table on pages F33-34 of the 2014 NJ Commercial Vegetable Production Recommendations to determine which fungicides are labeled for each specific crop and disease. Purple blotch – Purple blotch may survive on infected plant material in overwinter plantings and may cause problems in spring transplanted fields and seedbeds. As the weather begins to warm up and spring showers arrive Purple blotch may become problematic in some fields. Symptoms of Purple blotch include tannish-brown, elongated, concentric, circular lesions with chlorotic margins with lesions running parallel with leaf veins. Control of Purple blotch begins with preventative fungicide applications. Inspire Super (difenconazole + cyprodinil, 3 + 9) at 16.0 to 20.0 fl oz. 2.82SC/A. Applications of Quadris, Cabrio or Pristine at high rates will also help suppress Downy mildew. 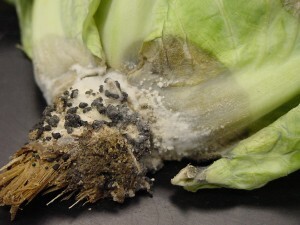 Bottom Rot/Drop – Spring season is beginning and growers should take precautions to help control Bottom rot (Rhizoctonia) and Lettuce drop (Sclerotinia) which may cause potential problems. For Bottom rot, apply Endura 70W (boscalid, FRAC code 7) at 8.0 to 11.0 oz 70W/A (only 2 applications per season), or iprodione (FRAC code 2) at 1.5 to 2.0 lb 50WP/A or OLF should be applied one week after transplanting or thinning and 10 and 20 days later (only 3 applications per season). For Lettuce drop, apply Endura (FRAC code 7) at 8.0 to 11.0 oz 70WG/A, or iprodione (FRAC code 2) at 1.5 to 2.0 lb/A, or Quadris (azoxystrobin, 11) at 0.40 – 0.80 fl. oz/1000 row ft 2.08SC, or Cannonball (fludioxonil, 12) at 7.0 oz 50WP/A beginning one week after transplanting or thinning and again at 10 and 20 days later. Uniform (mefenoxam + azoxystrobin, 4 +11) applied at transplanting or seeding will help control damping-off pathogens as well as provide early-season downy mildew control. For more information on control of Bottom rot and Lettuce drop and other important diseases of lettuce please see the 2014 New Jersey Commercial Vegetable Production Recommendations Guide.